Discussion in 'Tilted Art, Photography, Music & Literature' started by sapiens, Aug 12, 2011. Illinois, remember, the 's' is silent. Finished Dead Bodies Bite, Vol. 2. Found it a bit disappointing as some of the stories had grammar and spelling mistakes. Also, a few of the stories appeared to be written by middle school students. Starting on Apocalypticon, yes, yet another zombie book. Last one in the Kindle library. Hopefully it'll be better than the last one. Please take a look at the Library thread, many cool photos. I was wrong about Apocolypticon, it's not quite a zombie book. Pretty funny as well. Definitely not what I expected, but in a good way. Fun read so far. Finished Apocolypticon (author: Clayton Smith).Fun read. Going back to my barbarian days and will work on Conan The Barbarian, The Complete Collection by Robert E. Howard. Arisen, books 13 & 14. Also, still reading Lincoln at Gettysburg. damn.... I've fallen down the Clive Cussler black hole of the Dirk Pitt universe. will be back once I've finished reading oh.... about 19 books. I know that memoirs aren't autobiographies in the sense of being chronological, more or less. But Elvis Costello's Unfaithful Music & Disappearing Ink jumps around like crazy. This memoir might be a Must Read for serious Costello fans, not so much for casual fans. Switched gears and reading Great Tales Of The Golden Age Of Science Fiction by Isaac Asimov, Charles G. Waugh & Martin H. Greenberg. Still reading Great Tales Of The Golden Age Of Science Fiction, but, did manage to squeeze in Franz Kafka's The Metamorphosis over the weekend. That Metamorphosis is a quick one. (drug induced??) I accidentally read it once, as it was a free item on my Kobo (e-reader) so I thought I would check it out. "Chumash". A complete Old testament with extensive commentary selected from the various biblical scholars. It's got the full rashi and onkelos too but only in the original hebrew. It's good to know where your people came from and where it all started. Not-God, a history of AA. Fascinating. Finished Great Tales Of The Golden Age Of Science Fiction. WOOT WOOT! I just finished a Jack Reacher novel Echo Burning. My dad's been sending me these to read, they're really good. One thing I wanted to mention (and it was discussed here earlier) that I saw the movie before reading any of the books, and initially I was okay with Tom Cruise as the character. However, the more I read, the less and less Cruise fits him. 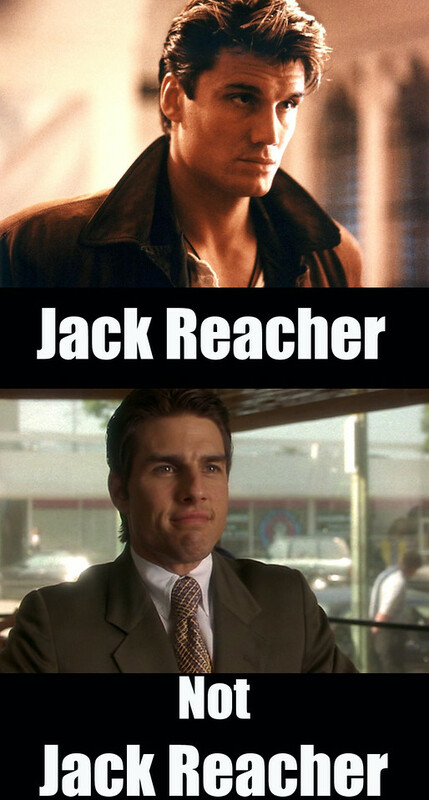 In my own head, I picture Dolph Lundgren (in his 30's) as Jack Reacher, and he meshes perfectly. HH author co-authored with Eric Flint "1633" a sequel to Flint's wildly successful "1632" which has spawned a whole series. I've read nearly all of the 1632 Universe novels and shorties. I neglected to say what I'm currently reading: 1635: "The Wars For The Rhine" be Flint co-conspirator Anette Pedersen. In the Seventeenth Century family connections, arranged marriages, religion, (of the nobility only, of course) mattered much more than ideology.